TripAdvisor’s 2016 Certificate of Excellence recipients include two Disneyland Paris hotels: the Disneyland Hotel and Disney’s Davy Crockett Ranch. This is a recognition of the service provided by these hotels. For the past 6 years, TripAdvisor has been rewarding hotels and other accommodation, tourist attractions, and restaurants throughout the world for providing exceptional customer experiences. 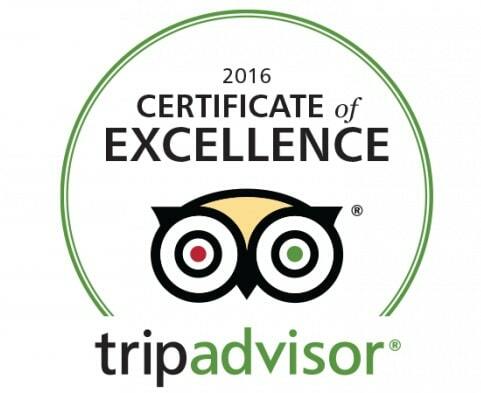 TripAdvisor’s Certificate of Excellence is based on the quality, quantity, and date of traveller opinions submitted to the website over a 12-month period. The Disneyland Paris hotels have regularly received rewards and glowing reports. Disney’s Hotel New York, for example, was named the TripAdvisor Travellers’ Choice prize winner in 2015. Because 85% of travellers are more likely to book a hotel that has received this kind of prize, this reward enhances our appeal. Book your Disneyland Paris hotel through our special hotels page. This year, the Disneyland Hotel and Disney’s Davy Crockett Ranch have been awarded the Certificate of Excellence. This is a wonderful recognition that our demanding standards have been met, and that our investments have been successful. The Disneyland Hotel has maintained its five stars since 2011, and this status was maintained in 2016. Disney’s Davy Crockett Ranch has held a TripAdvisor Certificate of Excellence since 2014, and was once more awarded this prize in 2016. The hotel has worked hard to maintain its rating, thanks to renovations undertaken since 2010, such as the inauguration of a new reception in July 2015, and refurbishments in all bungalows in the same year.